Successfully Added Dual Connection 3G + 802.11b/g/n Wireless Router to your Shopping Cart. Instantly turn your home connection into a high speed 802.11n WiFi hotspot or share your 3G connection on the go with this ultra convenient router. This amazing device offers you two ways to enjoy true wireless freedom. The small size makes it a perfect travel router to take with you wherever you go. With support for most popular USB mobile broadband adapters, you can share your 3G internet connection regardless of whether you are on the road, waiting in the airport, or staying in a motel room that has no internet. In addition, featuring 802.11b/g/n technology, you can instantly turn your home Ethernet connection into high speed WiFi. You get faster speeds and more stable and reliable wireless connections when gaming, downloading, streaming multimedia, or just browsing the web. Enjoy a better Internet experience now and buy this compact sized dual connection 3G + 802.11b/g/n Wireless Router. With its low wholesale price, it’s also a perfect item for resale. Order today and we will ship out within a day. Brought to you by the leader in direct from factory electronics, Chinavasion. 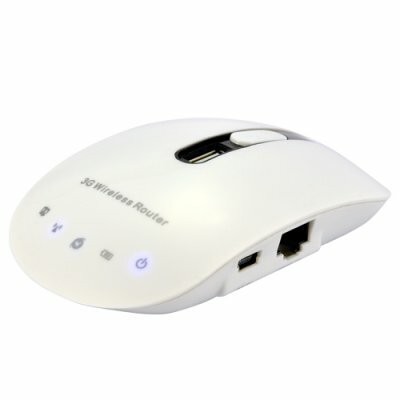 Convenient wireless for your desktop computer, laptop, gaming device, smartphone, tablet PC, etc. Share your 3G connection in the car, on the bus, in the train... wherever! How do I configure this wireless router? The IP address is underneath the battery, on the bottom of the router. Connect your Ethernet cable and everything is done through a web-based configuration/management interface. How do I set up my 3G modem? In the same way as above. Also, if your SIM card needs a PIN code, make sure to enter it in the field provided. What is the default user/pass for this device? It is provided on the bottom of the router, underneath the battery.